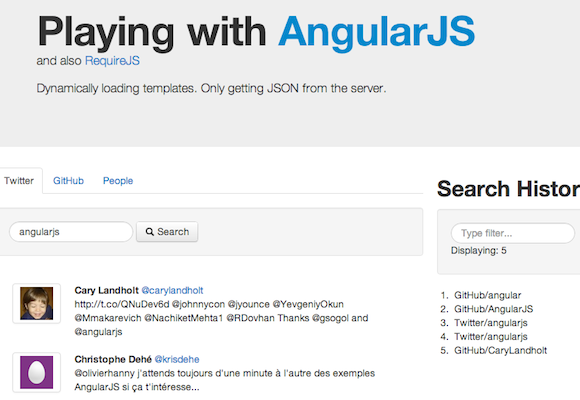 AngularJS 1.0.3 bouncy-thunder and 1.1.1 pathological-kerning released! What's new in these releases? A number of bugfixes, improvements to the docs, and a little refactoring to make debugging and profiling easier. In 1.1.1 pathological-kerning you'll find all the bug fixes from 1.0.3 bouncy-thunder, plus some new features to try out in your code. Most notably, in version 1.1.1 we've added the frequently requested FormController.$setpristine method, which resets a form's pristine state so that the form can be reused after submission. Thanks to the community contributors responsible for many PRs in these releases: Josh Adams, Wes Alvaro, Godmar Back, Xiangru Chen, Dave Clayton, Jamison Dance, Tom Davis, Pedro Del Gallego, Zach Dexter, Haralan Dobrev, Benjamín Eidelman, Brian Ford, Iwein Fuld, Adrian Gheorghe, Uri Goldshtein, Kai Groner, Tom Hughes, John Hume, Iristyle, Kris Jenkins, Sudhir Jonathan, Rado Kirov, Pawel Kozlowski, Daniel Luz, Adam Macejak, Tim Macfarlane, Max Martinsson, Stein Jakob Nordbø, petrovalex, Gregory Pike, Fred Sauer, Shyam Seshadri, sgtpep, Braden Shepherdson, Dean Sofer, JP Sugarbroad, sqwishy trick, Jeremy Tymes, Anna Vester, Christian Vuerings, Kevin Western, Cameron Westland, Jonathan Zacsh, Jay Zeng, Zhenbo Zhang, Jimmy Zhuo. In particular, thanks to Pawel Kozlowski and Peter Bacon Darwin for joining us as committers on AngularJS to help manage the pull requests for these and future releases. Turns out we forgot to publish September's meetup videos from the Mountain View meetup. Yikes! Well, better late than never. Actually, this is some of our best content to date. For the first time, Miško Hevery demystifies AngularJS Directives. If you've struggled with some of the concepts and reasons behind writing directives, this one is for you. As a perfect follow-up, Vojta Jína gave a presentation on writing unit tests for directives and discusses techniques to make them run quickly. For folks just starting out with Angular, Igor Minar walked folks through the basic features of Angular in writing the ubiquitous ToDo application. At the end, Dean Sofer (aka ProLoser), presented JobVite - a cloud-based recruiting platform written in AngularJS. Folks often ask us where they can find source for apps that cover more techniques than the examples on angularjs.org or the tutorial. If this is your question, then this post is for you! 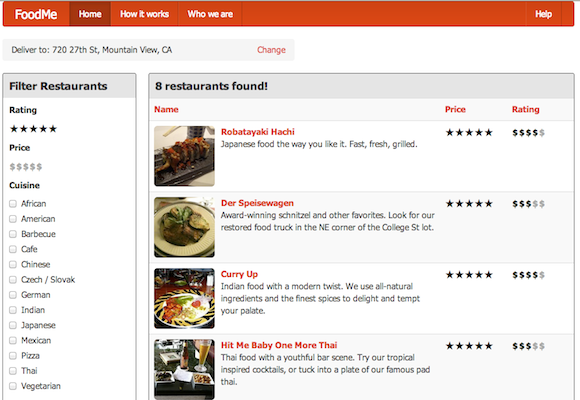 As part of our tutorial session for Devoxx 2012, we built this simulated take-out food ordering application. This one is for you CoffeeScript fans out there. Though it's a demo app, it has many of the features you'd want in a skeleton for many real apps you'd want to create. Nice job, Cary Landholt! Want to build native-looking apps using Chrome? TextDrive is a great place to start. Vojta Jína (the author) and Brad Green (Angular eng manager) did a Hangout video with the Chrome Apps Office Hours on this. For another take on the same application, you can also check out this post from Google Apps team and this Google Drive tutorial which walks through building an Angular app against the Drive APIs. If you're looking to build an app with high curb-appeal, look no further. wReader is another Chrome platform app that looks and feels like native desktop apps. 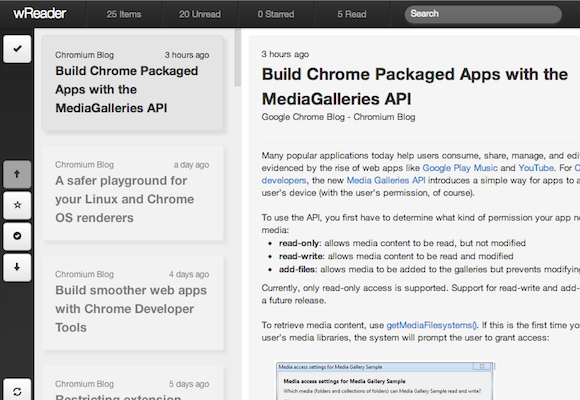 It is hard-wired to browse the Google Chromium blog, but it could easily be repurposed as a skeleton for other uses. Try it live here. 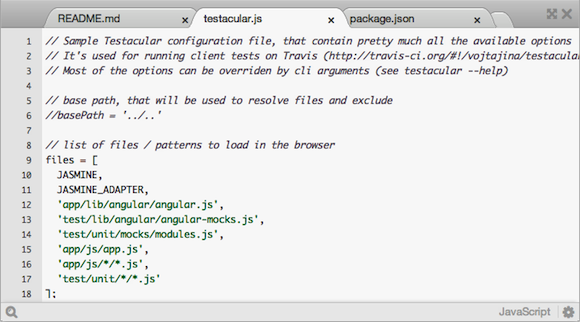 For more examples, please be certain to visit builtwith.angularjs.org. You can search by the tag 'Open Source' to find more apps with source available. And when your app is ready, please submit it for the world to see!